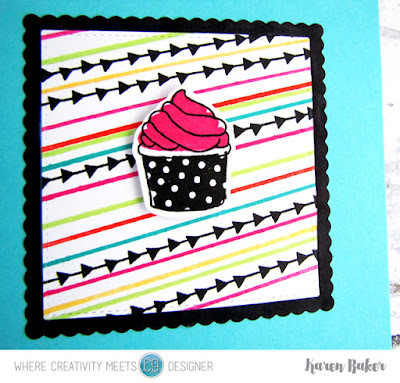 I'm back today with another challenge card that Nicole from Right At Home is hosting for National Craft Month. This time I chose to copy her technique of using masks to create a watercolor background for the Try a New Watercolor Technique. I have never done this before, and I do think I am hooked now! It offers just the right amount of messiness for my liking. 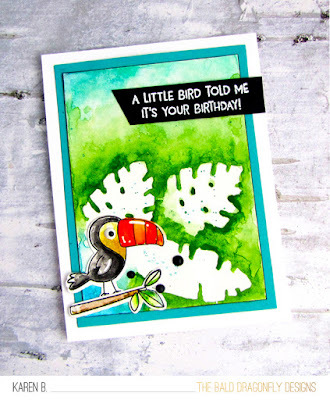 I used my newest stamps, from Hello Bluebird, called Silly Birds, and the die set called Tropical Foliage. Instead of using masking paper, I just cut the Tropical Foliage from white cardstock, used removable adhesive to attach them to watercolor paper, and then painted around the edges, dis some splattering with the watercolor paint, and then removed the leaves. 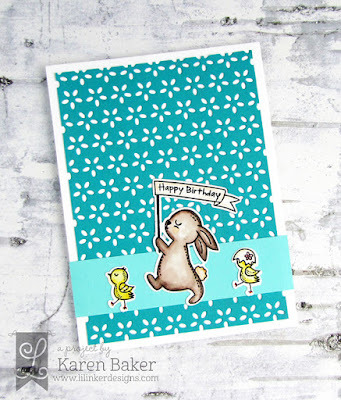 I then stamped the bird and branch separately, die cut them, and affixed them to the card. The sentiment from Silly Birds was white heat embossed onto black card stock, and then I finished the card by adding a custom Nuvo Drop eye to the toucan and a few black Nuvo Drop embellishments. 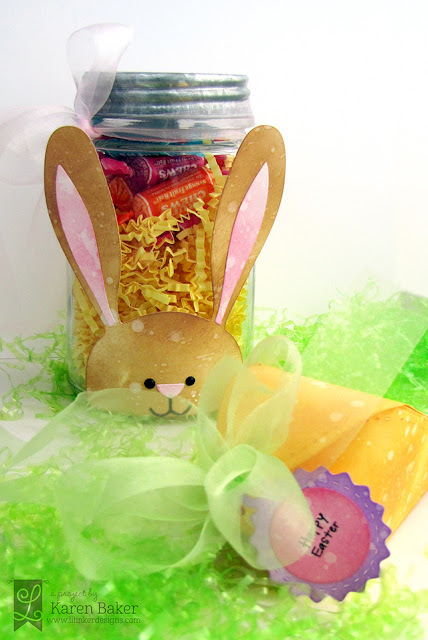 The sweet Nicole from Right at Home has a series of challenges that she put up for National Craft Month. I'm a little bit late, but wanted to try to participate in some, as they really put my thinking cap on and have the chance to have some fun! 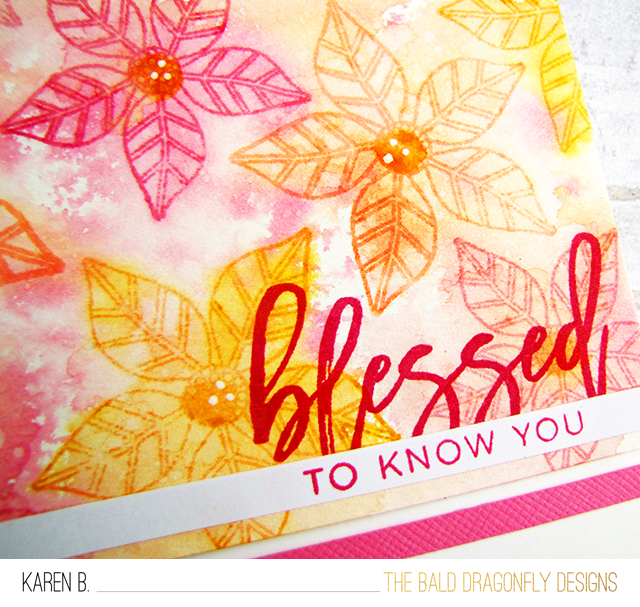 I started with the challenge to Use a Holiday Item for a Spring Card, so I pulled out the Christmas Foliage Stamp Set, stamped some flowers onto watercolor paper, and used Catherine Pooler Inks to color and create a background. 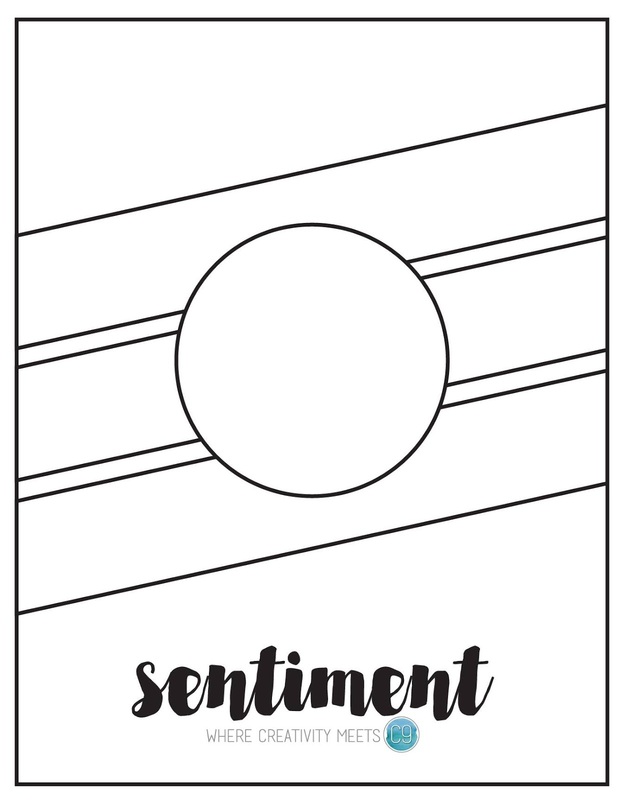 I then used Script Greetings to create the large sentiment and small sentiment strip. I'm a guest over at the Butterfly Reflections Ink Blog today with these cutie-pie critters! Please stop by to see what kind of card it is and say hi! 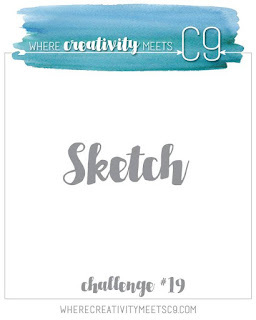 I have a card up on the Where Creativity Meets C9 Challenge Blog for Challenge #19: Sketch. 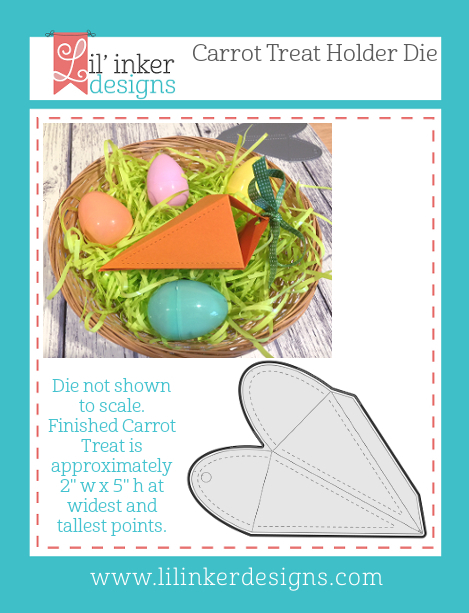 The current challenge ends on in a few days, on March 29th, I hope you have a chance to play along! 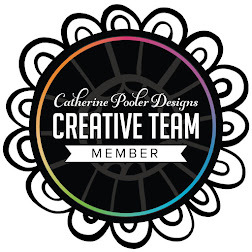 Check out Where Creativity Meets C9 on Facebook and Instagram! 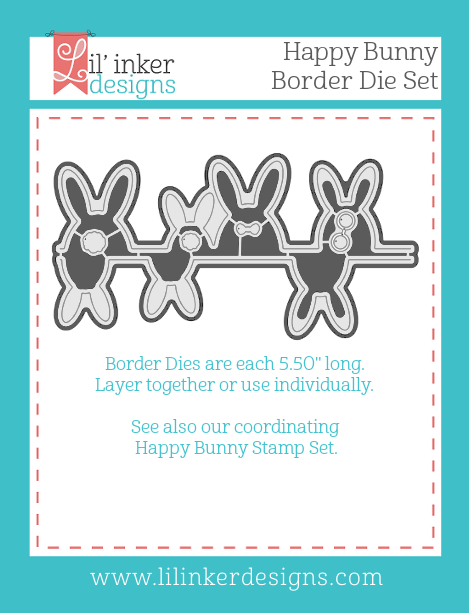 Color Challenge at Stamp Nation! 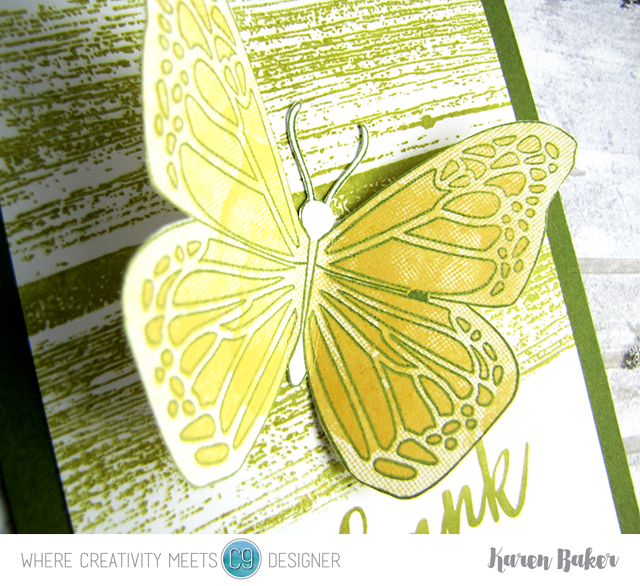 There is a super fun Color Challenge over at StampNation, it features the Pantone Color of the Year. If you like purple, this one is for you! 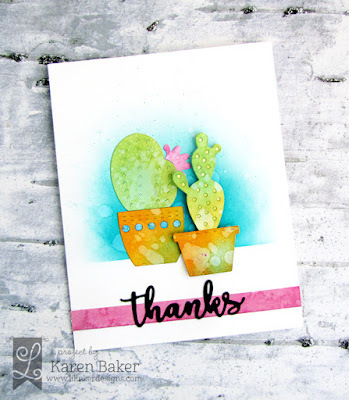 Please check out my card over there fore inspiration, featuring some fun Catherine Pooler products! 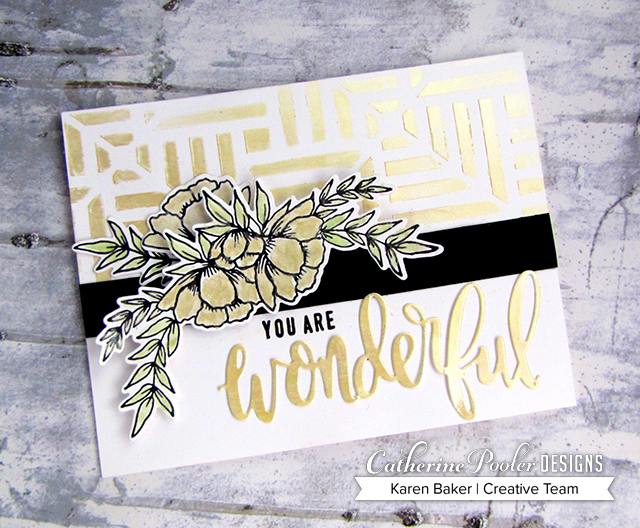 Such an elegant and classy release this is from Catherine Pooler Designs, and it is called All That Jazz! (affiliate links used) This collection features All that Jazz Ink, stamps, dies and background stamps, and individual items the previously released Counting Blessing Stamp of Approval Collection. I've got a few projects to showcase today for the first day of the blog hop. 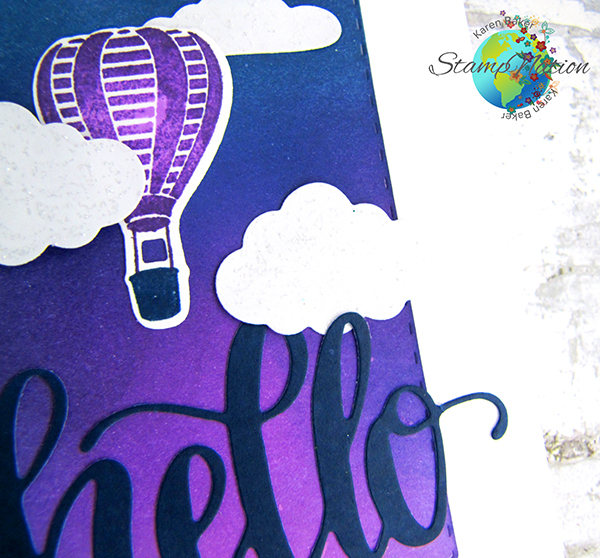 This first one started with the Ultra Smooth White Cardstock and I stamped it with the new Doin' the Polka Background Stamp with Midnight Ink. 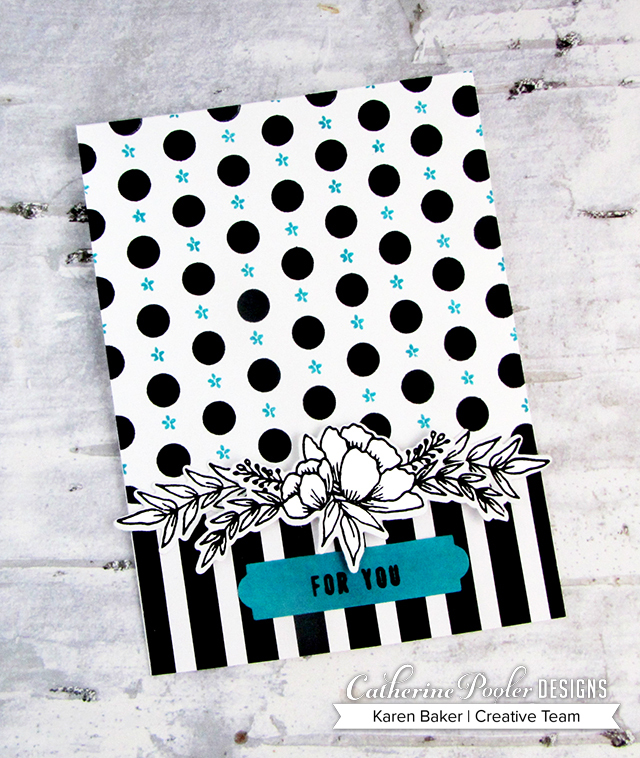 I added a strip of classic black and white stripe patterned paper to the bottom, from the new Black Tie Gala Patterned Paper. 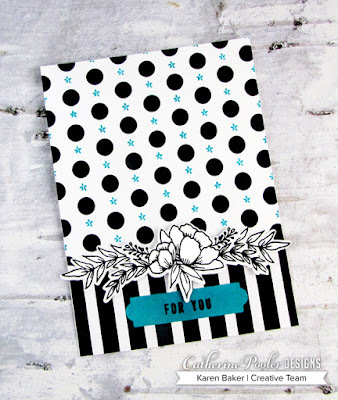 I added some little flower details to the polka dots with a stamp from Grateful Heart in All that Jazz Ink. 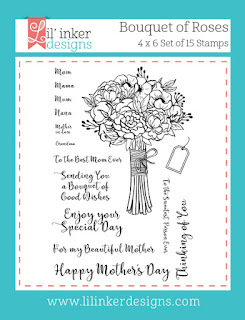 The dots and stripes were divided with some lovely flowers from Grateful Heart, and the sentiment, from Good Things Stamp Set cut from the Tags, Etc. Die Set. 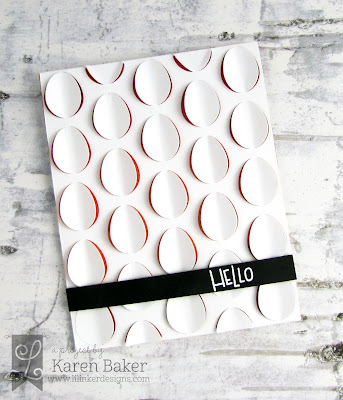 For this next card, I started with a white card base from the Ultra Smooth White Cardstock and used Mother of Pearl Nuvo Mousse over the new Square Dance Stencil on the top half of the card. 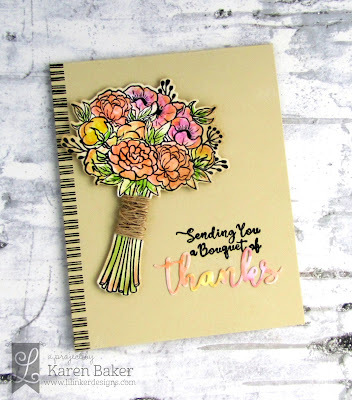 I then added a black strip of paper, topped with the beautiful flowers from Grateful Heart, colored with the Nuvo Mousse. 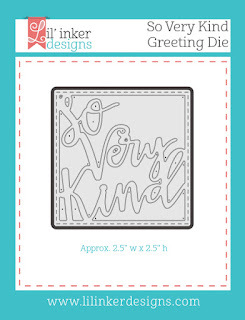 The sentiment comes from the stamp Good Things, and the Wonderful Die covered with the mousse. 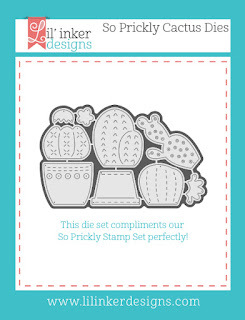 And last but not least, I have a clean and simple card, featuring the Leaf Motifs Stamp Set, and Tags, Etc. 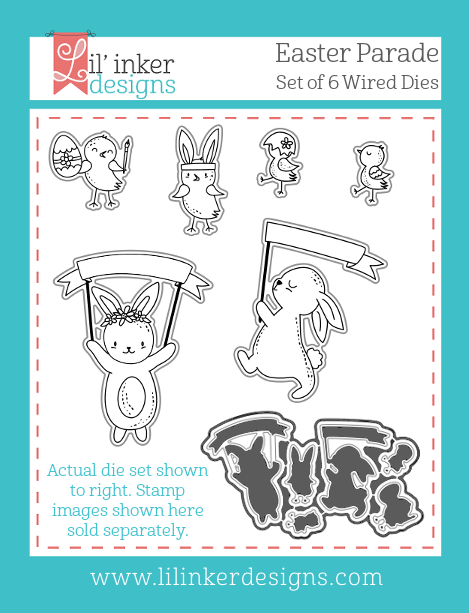 Die Set. 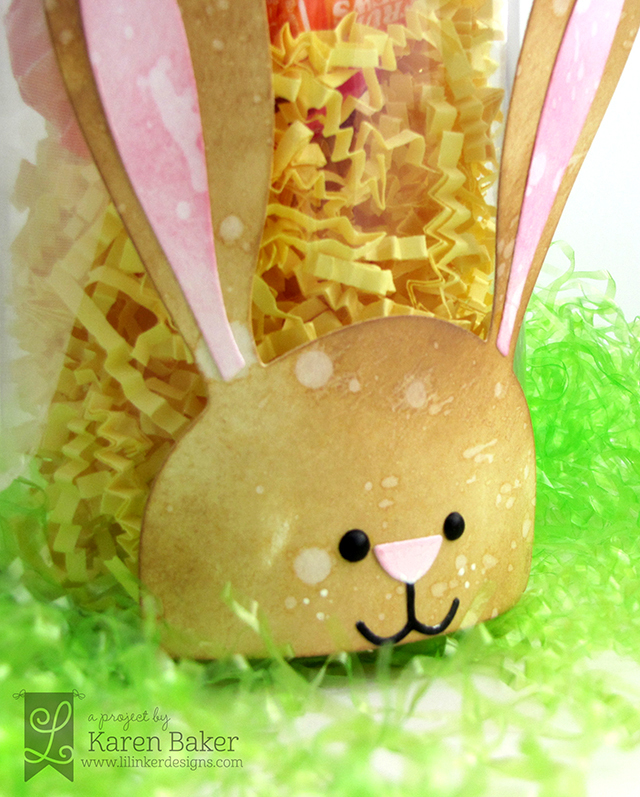 The background is the new Sand Dunes Card Stock cut with the Tags, Etc. Dies. 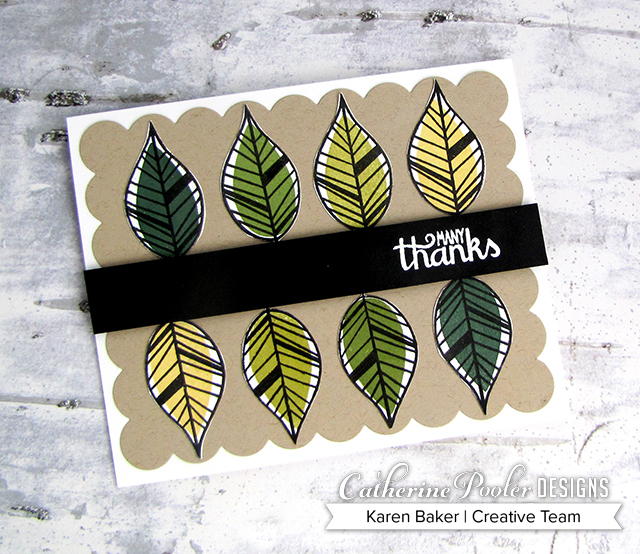 I stamped some leaves from the Leaf Motifs Stamp Set, and the solid colors are Spruce, Eucalyptus, Green Tea and Shea Butter. 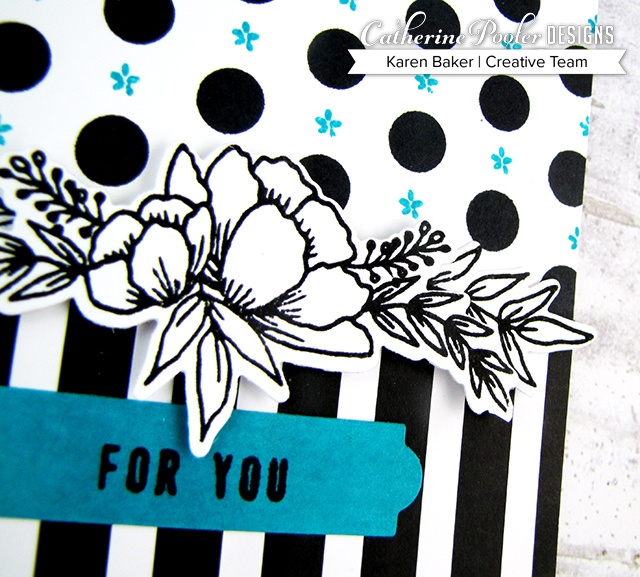 I added a black strip that has a white heat embossed sentiment from Leaf Motifs. Here's a complete look at the products being released on March 20th, and used on my projects today! 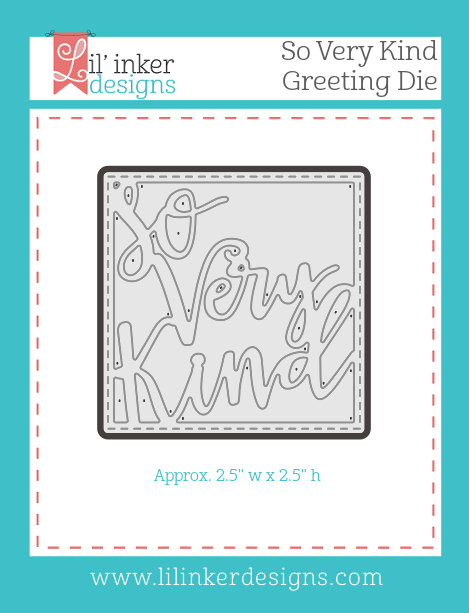 My first project today features the So Very Kind Greeting Die, which is a perfect die to create a shaker! 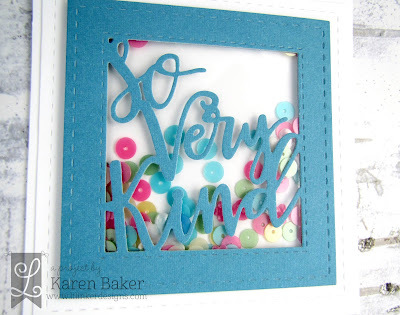 I die cut the greeting from blue paper, backed it with acetate, added some fun spring sequins and then adhered it to a white square card base with dimensionals. How easy?!! 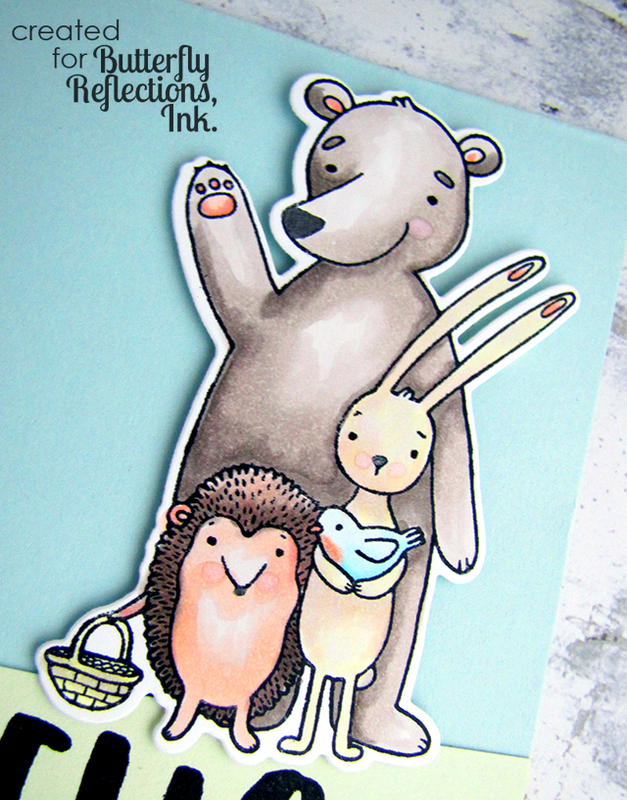 My next card, I think, is so stinkin' sweet that I just can't stand it! 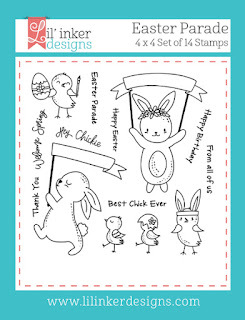 These critters in the new Easter Parade Stamp Set are the sweetest, and are not just for the Easter Season. 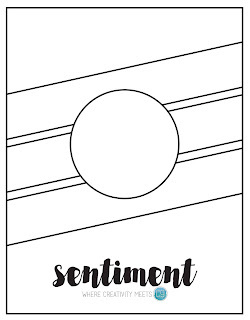 I love how there are additional sentiments to be included in the banner, beyond Easter/Spring, such as this happy birthday one. 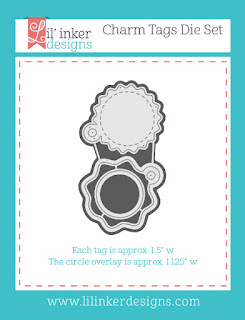 I started this card with a die cut blue background from the previously released Cover Up Die: Eyelet. I adhered that to a white card base and then attached a lighter blue panel. 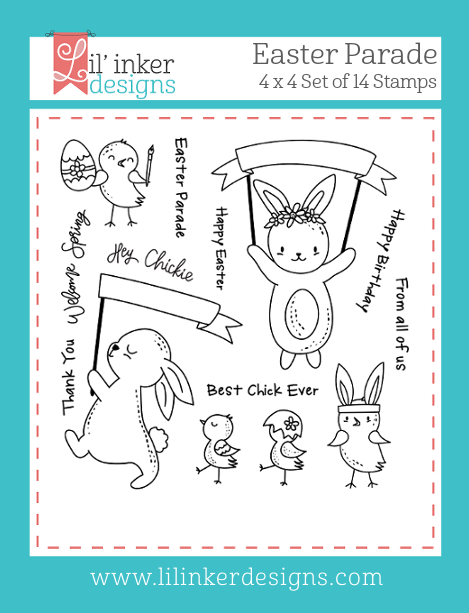 I then stamped and colored some of the parade animals from the Easter Parade Stamp Set and die cut them from the coordinating Easter Parade Dies. That is it! 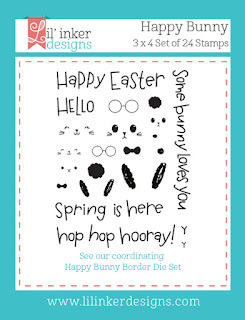 One last project for this release, and it features the cute Happy Bunny Border Die and Happy Bunny Stamps, along with a sentiment from Easter Parade Stamp Set. 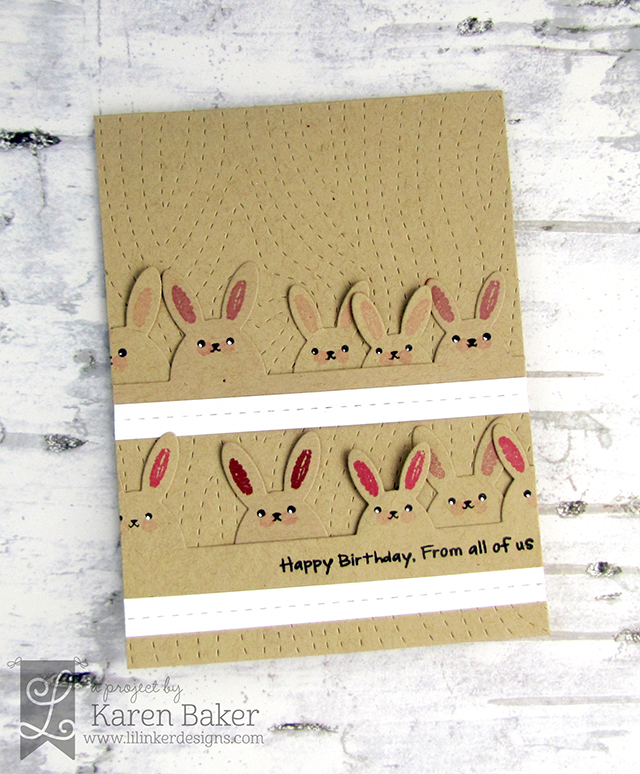 This card was super easy, I embossed a kraft card panel with the previously released Cover Up Die: Stitched Woodgrain. 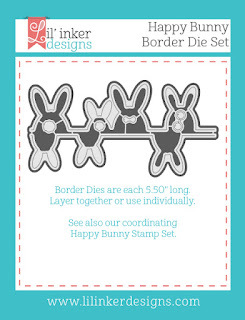 I die cut a few bunny borders from Happy Bunny Border Die then "dressed" the bunnies using stamps from Happy Bunny Stamps. Don't forget to leave a unique comment along the each of the stops on the hop! You can win the ENTIRE release by leaving unique comments on each of the stops along the hop each day. 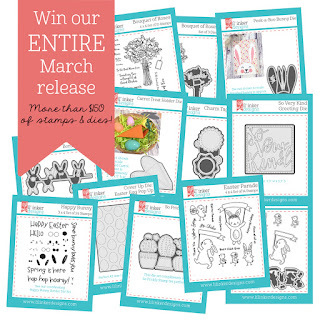 Comments should be left by 3/18/18 by 11:30 pm EST to be eligible to win. I've got my FAVORITE projects to showcase today from this release, although each and every product from this release is amazing! 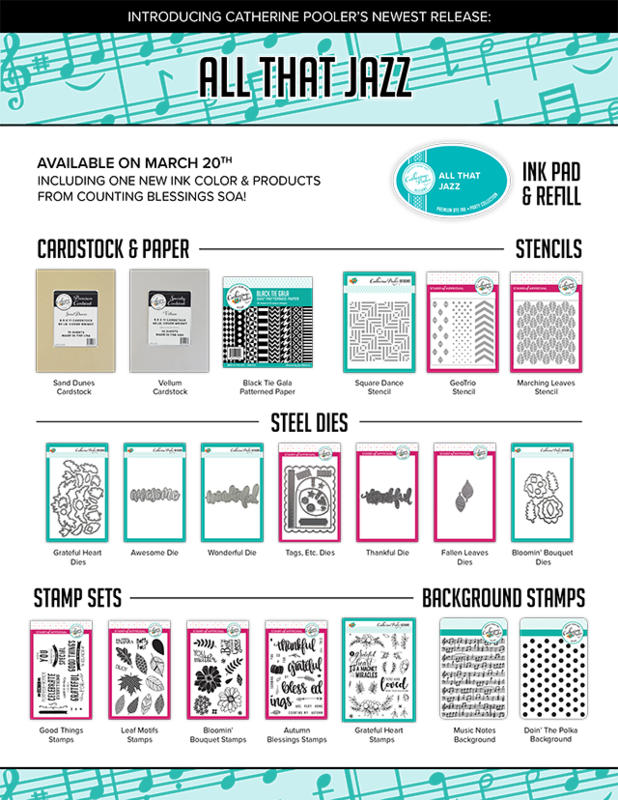 I really enjoy how Laura from Lil' Inker Designs really thinks about how well every item in the release coordinates together, but also can be used separately. I was so inspired by these March products, it was hard to put them down! 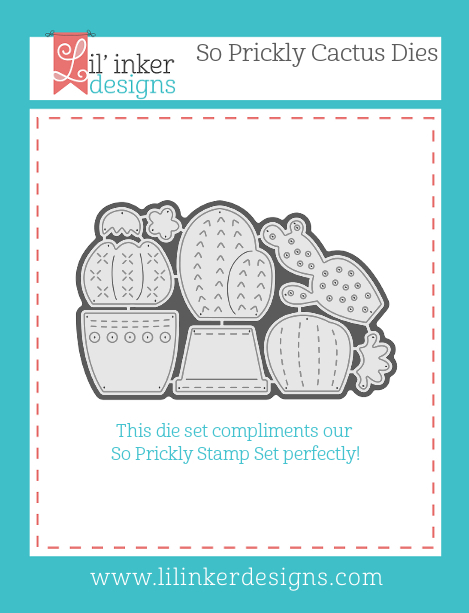 I created the above project with the new So Prickly Cacti Dies, that coordinate with the previously released So Prickly Stamp Set. What I love about the dies, though, is that they can be used completely separately, as I have done here! I die cut some of the pots and cacti from white cardstock and colored them with distress oxide inks. 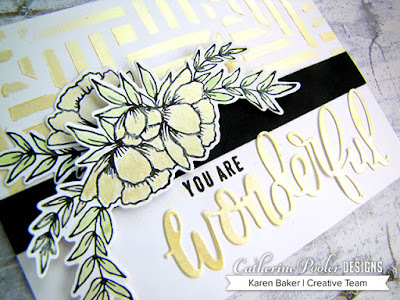 I adhered them to a white cardstock panel that was also treated with some distress oxide inks, and then added a simple sentiment die cut from the new Bouquet of Roses Die Set. 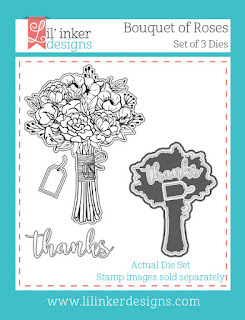 This next card pairs the Bouquet of Roses Die Set with the Bouquet of Roses Stamp Set. I started by stamping the beautiful bouquet on watercolor paper and colored with Zig Real Clean Color Brush Markers. I then wrapped the stems with some burlap string. Before adhering to the linen color card base, I stamped some lines on the left side of the card front using the tag included in the Bouquet of Roses Stamp Set. After stamping the sentiment from this set, and adding a die cut word from the Bouquet of Roses Die Set, the bouquet was affixed with dimensional adhesive. 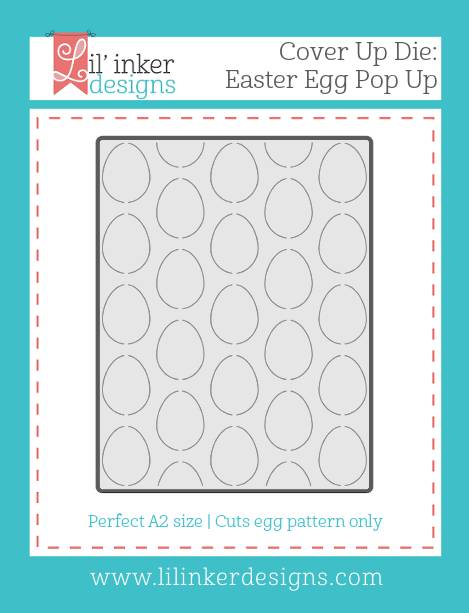 And finally today, I have a fresh, textured card featuring the Cover Up Die: Easter Egg Pop Up. 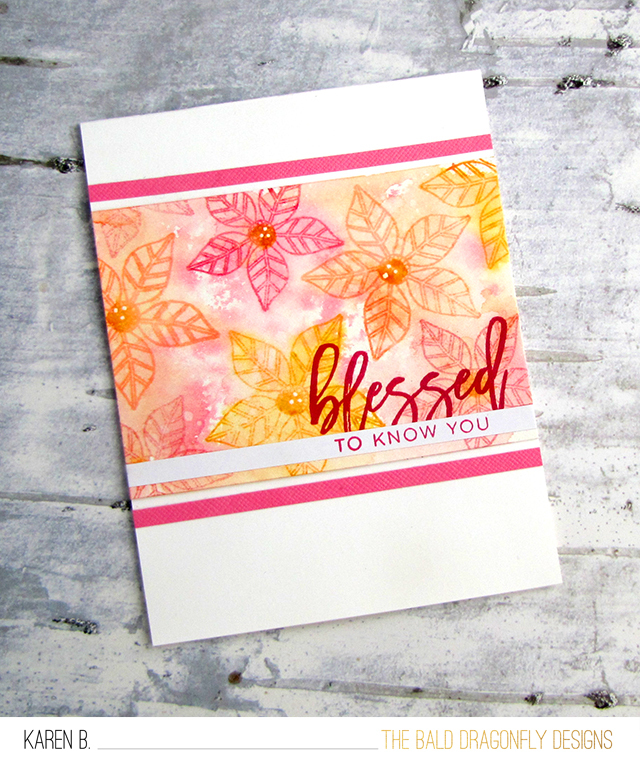 I started with a white card base, with the front covered in a mix of orange, red and pink distress ink. I then added a white panel cut from the Cover Up Die: Easter Egg Pop Up, lifting each edge of the "egg" up to uncover the bright color underneath. 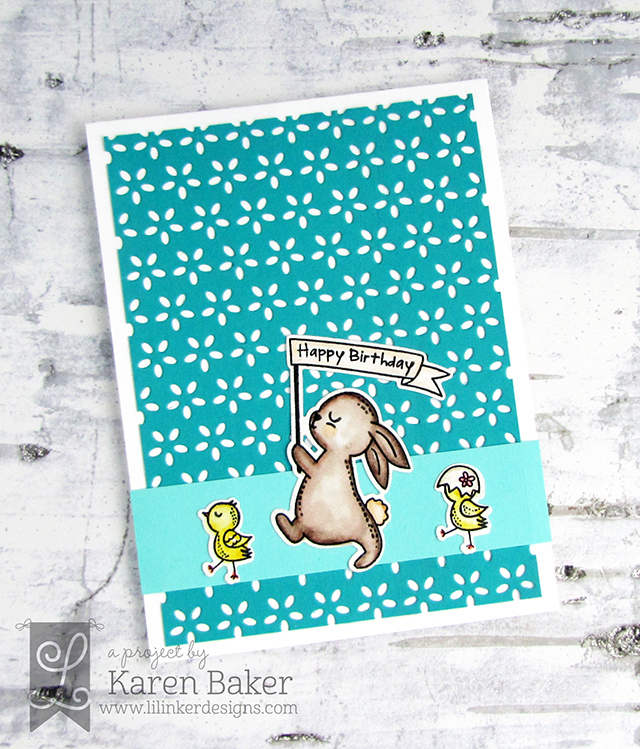 I finished the card with a sentiment strip, stamped with Happy Bunny Stamps. 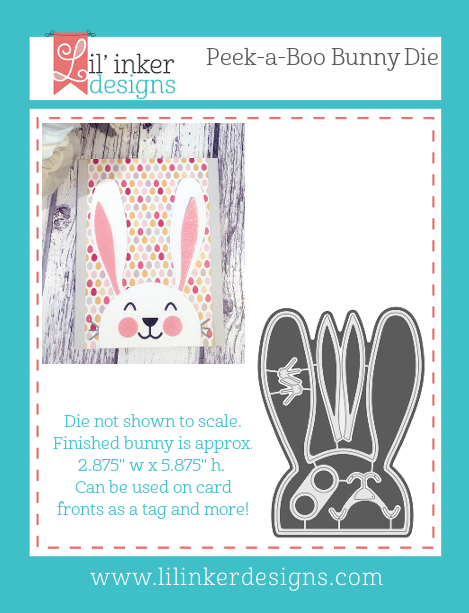 I paired up a few projects for a sweet little Easter duo today. I started by die cutting the bunny from the Peek-A-Boo Bunny Die. I colored white cardstock with distress ink...brown for the head, pink for the inner ears, and black for the face. 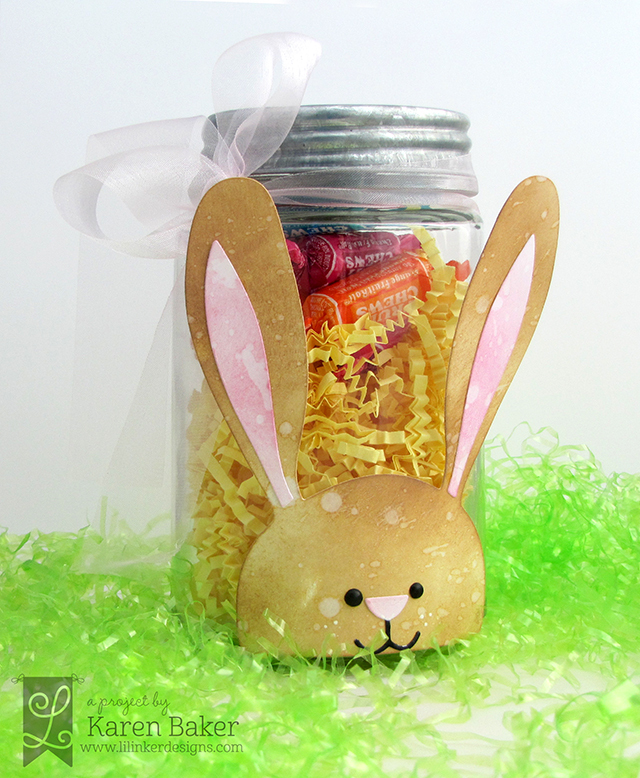 I added two black Nuvo Drops for the eyes, and attached the bunny to the bottom of a clear mason jar and filled it with candy. A sheer bow finishes off this look. 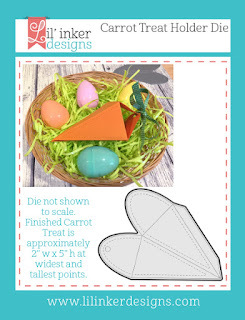 For my second treat, I die cut two passes of the Carrot Treat Holder Die from white cardstock and colored it with orange distress ink. 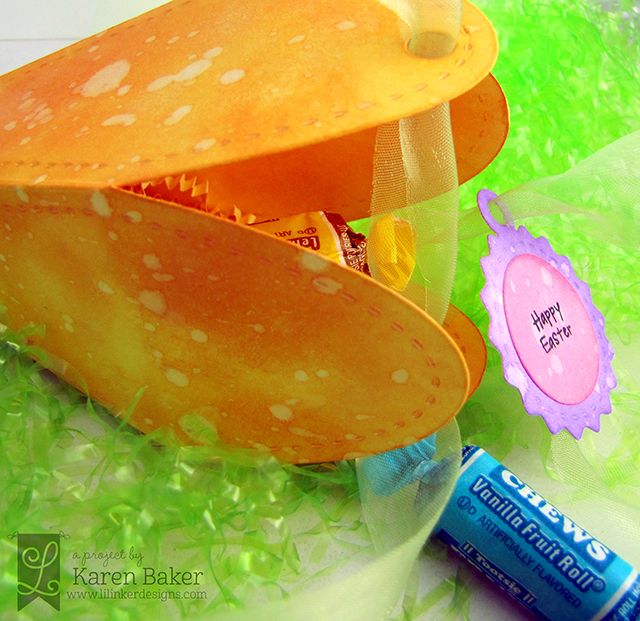 This is a super easy treat container to assemble...two strips of tape and some ribbon and that is it! 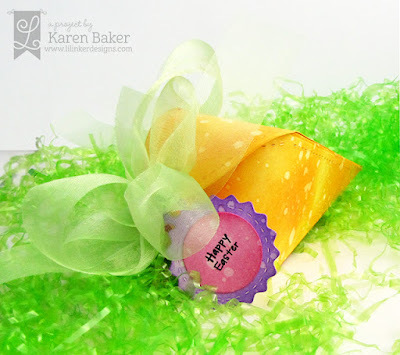 I filled the carrot with some treats and grass, then tied off the top with some ribbon and a cute little tag, assembled from the Charm Tags Die Set and stamped with a cute little sentiment from the new Easter Parade Stamp Set. I just love how soft and sweet this duo gift turned out! I get giddy every time there's a new Where Creativity Meets C9 Challenge posted, this month is a lot of fun. 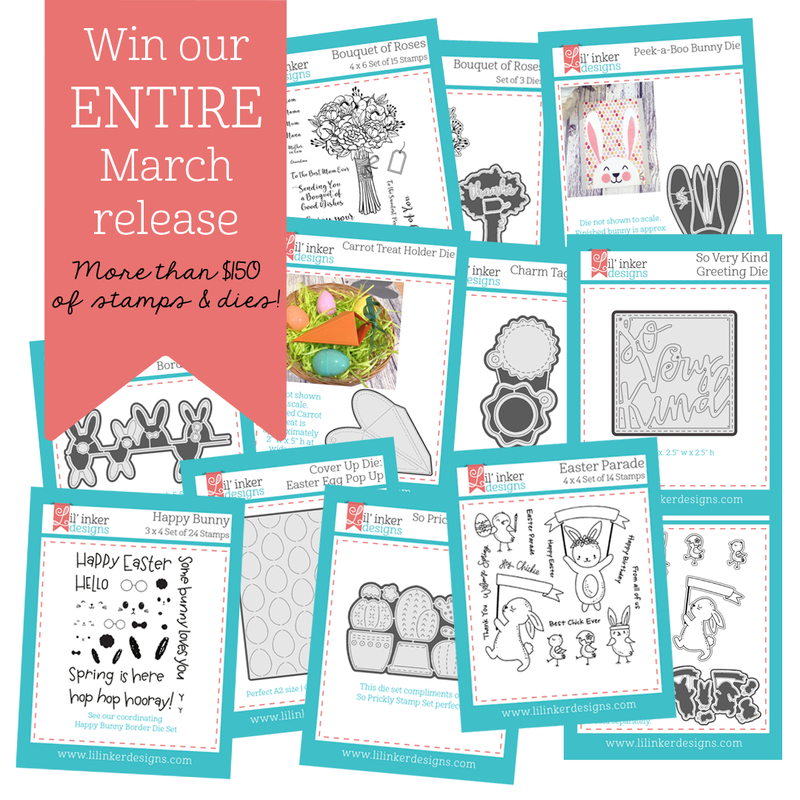 It's a sketch challenge, and we cannot wait to see how you use your fun Concord & 9th products, as this challenge is dedicated to the innovative stamp company and their products! 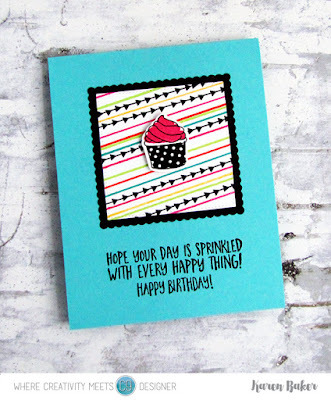 I started this card with a blue cardbase that I had stamped a sentiment from Sweet Sprinkes in black. Then I die cut a scalloped frame and square panel from the Love You So Dies. On the panel, I stamped a series of stripes to mimic the sketch with stamps from Happy Balloons. I finished with a cute lil' cupcake that I stamped and die cut from the Sprinkles Turnabout Bundle. The challenge is sponsored by the fabulous Concord & 9th and one lucky random entry will receive a $25 gift certificate for a Concord & 9th shopping spree. 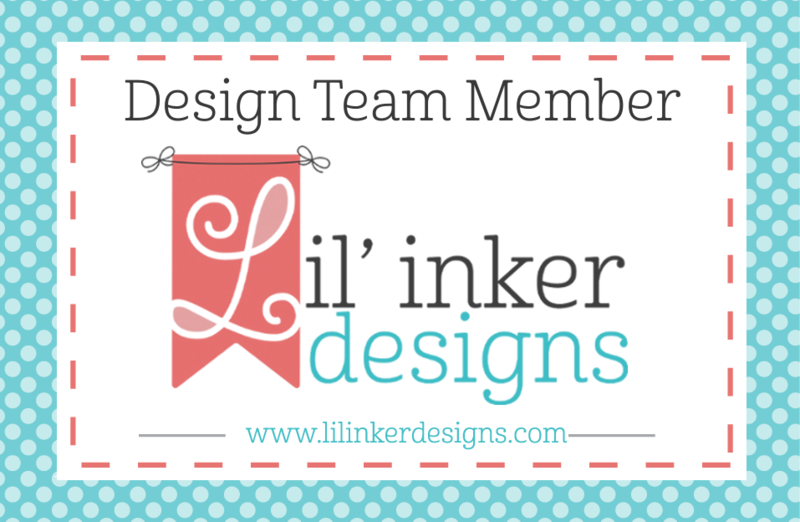 The favorite entry will be asked to guest design for a future challenge! 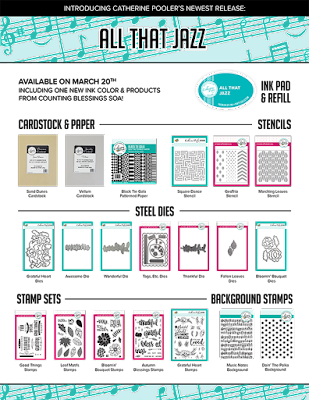 The challenge runs until March 29th, so there is plenty of time to pull out your favorite Concord & 9th stamps and die and create Plus, new Concord & 9th products were released TODAY and they are fantastic!